Abstract: ATi has dramatically increased the value of its videocards with the release of the ATI Radeon X1950 Pro, this card has a remarkable among of bang for the buck. Gamers have a ton of options when it comes to videocards, but the line up is especially crowded when looking though a forrest of mid-range graphics cards, with many different competing GPUs from nVidia and ATI vying for attention. If you go into a store and just stare at the wall of videocard boxes you'll never be able to pick out what's best for your particular gaming needs, or budget. Wading through a field of videocard and GPU options can be frustrating, especially because 6 months down the road whatever you chose is going to have lost a lot of its lustre. What I usually recommend is this; find the fastest videocard GPU you can afford, then, skimp on every other component, CPU, drives, motherboard, whatever. Now go back to the fasted videocard you could afford, and use the fact you've skimped everywhere else and bump up that GPU to the next fastest offering. My logic might sound odd, but if you think about it, a good videocard unlocks gaming at high screen resolutions with wondrous levels of eye candy actually turned on. There's always the overclocking option, but if you attempt that with a value oriented videocard you'll probably find it doesn't boost gaming performance by much. ATi has dramatically increased the value of its videocards with the release of the ATI Radeon X1950 Pro, this card has a remarkable among of bang for the buck. The 'bestest most fabulous' aspect of the Radeon X1950 Pro generation is that ATi has done away with the clumsy Crossfire implementation hardware. There are no more messy external connector cables, no more Master videocards... so Crossfire might just have a chance in hell of succeeding now. The Asus EAX1950PRO/HTDP/256M/A is the first of this new class of native CrossFire compatible ATi videocards to land on PCSTATS test bench. The best thing about the Asus EAX1950PRO is that it doesn't require a Master card to run Crossfire. 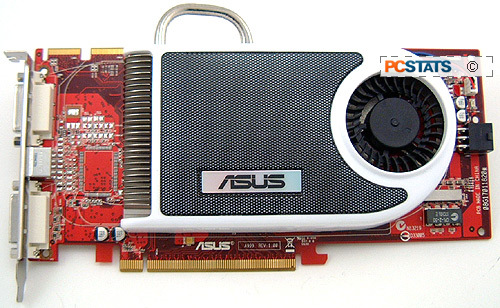 The ATi Radeon X1950 Pro based PCI Express x16 videocard has 256MB of GDDR3 memory. It supports dual digital monitors and TV/S-Video output, along with high definition output through a set of component outputs. It doesn't come with a whole lot of software for an Asus videocard, only a driver disc and some Asus video utilities. The Asus EAX1950PRO HTDP/256M/A retails for a very competitive $233 CDN ($205 US, £107 GBP) so it's not overly expensive, but it's not exactly cheap either. In case you're worried about software compatibility, the Asus EAX1950PRO/HTDP/256M/A will run on Windows Vista just as well as it does on Windows XP. 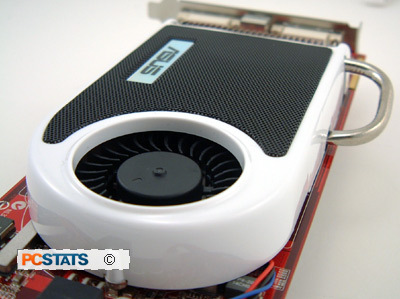 The ATI Radeon X1950Pro GPU is clocked at 575 MHz, while the 256MB of GDDR3 memory runs at a brisk speed of 1380 MHz. The ATI 'RV570' GPU has 36 pixel and 8 vertex shaders, 12 pixel pipelines, and supports Shader Model 3.0, DirectX 9.0, OpenGL2.0, and anti-aliasing with HDR. High Definition content playback is supported by ATI's AVIVO, H.264 and HDCP compliance. DirectX10 is not supported. User's Manual, Driver CD, Civilization IV Game CD, TV/Component Break Out Box, DVI to Analog Converter. Asus use a custom heatsink which operates extremely quietly, but since it's bigger than the stock model takes up the adjacent expansion slot too (it's a dual slot heatsink). Like many PCI Express x16 videocards, the Asus EAX1950PRO requires an additional six pin PCI Express power connector connected before it can be used. The card itself is 23cm long, and a heatpipe extends up past the PCB some distance to it may not fit into all slim line chassis. At the very top front of the Asus EAX1950PRO videocard are its two native Crossfire bridge interconnect edge connectors. 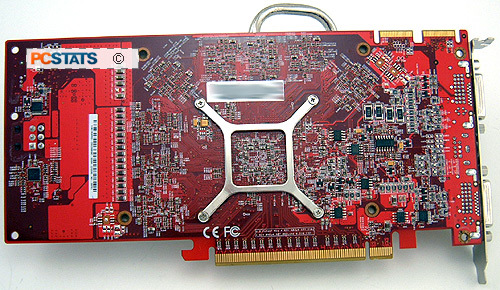 Each 20 pin connector is used to support native Crossfire with an identical second videocard (of the same product series) on compatible motherboards. We'll get into the changes to Crossfire in a bit, first here are a few more details on the Radeon x1950Pro GPU. The Radeon X1950 Pro core is built on TSMC's 80 nanometer manufacturing process, and the GPU has 330 million transistors on a silicon die 230mm^2 in size. Complex little chip isn't it? To protect the silicon from damage, ATi places a shim around the edge of the OGLA chip substrate, which helps prevent the heatsink from causing damage. While most manufacturers basically build up their X1950 pro videocards parts from the same basic motherboard, Asus has done a nice job with the thermal solution on the EAX1950PRO HTDP/256M/A model. It is quiet, it blows air towards the rear of the chassis, and it looks pretty cool too. Although it does occupy two expansion card spaces, only one bracket is used. It's sort of an odd mix, as the heatsinks' exhaust vent doesn't actually exhaust anything of that hot air outside the chassis. The bundled in accessories are limited to the basics; a component output splitter cable, power cord, and DVI-to-Analog adaptor. Clearly this is a mainstream card aimed at a mainstream audience. Oddly, a native Crossfire Bridge Interconnect Cable is not included with this videocard... Asus have an another, identical videocard with the 'crossfire' name branded on the box that does ship with two cables, but what's the point of this? Why not just include the bridge interconnect cables with every card that is Crossfire compatible? Well the answer is a somewhat disappointing one; ATI's official sore www.shopati.ca sell the CrossFire bridge interconnect cables for $12CDN each. PCSTATS goes into the technology behind the Radeon 'RV570' GPU next.